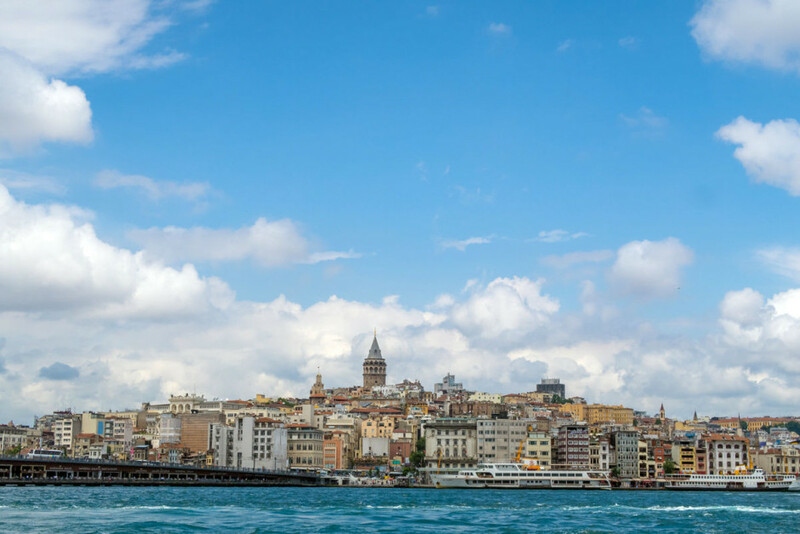 STRADDLING THE BOSPHORUS STRAIT between Europe and Asia, Istanbul is etched with thousands of years of history, bearing the marks of the Ancient Greeks, Persians, Romans, Byzantines, Turks, and Silk Road traders who’ve lived here over the centuries. When visiting one of the world’s richest cities in terms of cultural heritage, 48 hours is hardly enough time to even scratch the surface. That being said, it was just enough time for me to get a taste of what Istanbul has to offer — incredible architecture, great food, a fresh art scene, and shopping in some truly one-of-a-kind markets. And although I wish I’d had more time, let’s just say I’ll be back. 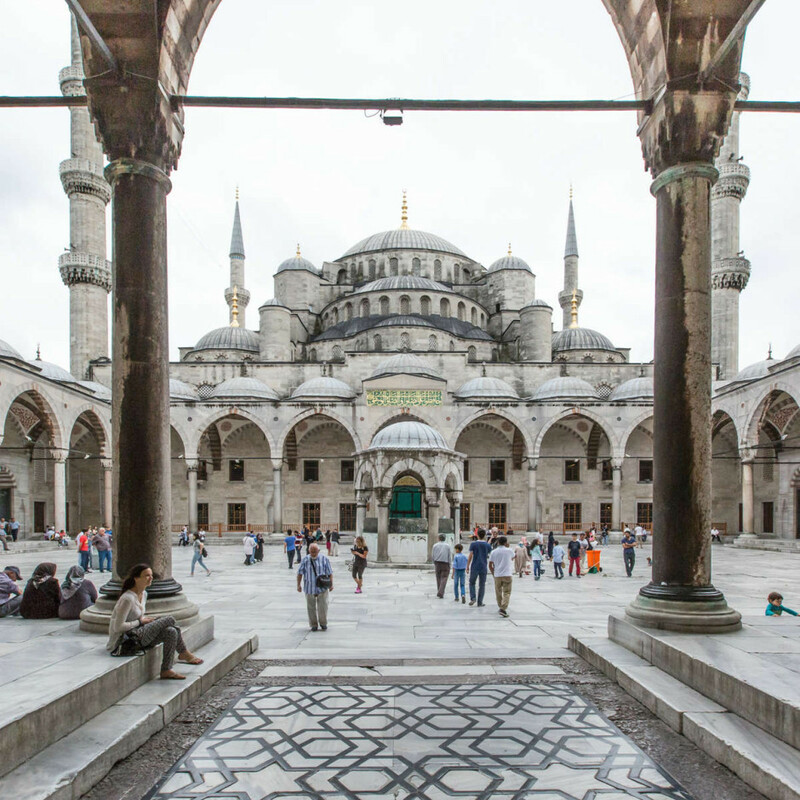 The Blue Mosque (Sultan Ahmet Camii in Turkish) is definitely one of the places you have to see, regardless of how much time you have in the city. With its six minarets dominating the Istanbul skyline, this is one iconic structure that's hard to miss. The inside of the Blue Mosque reveals the truth behind its nickname. Make sure to spend enough time to really take in the beauty and immensity of the place—and all those intricate blue tiles adorning the interior. 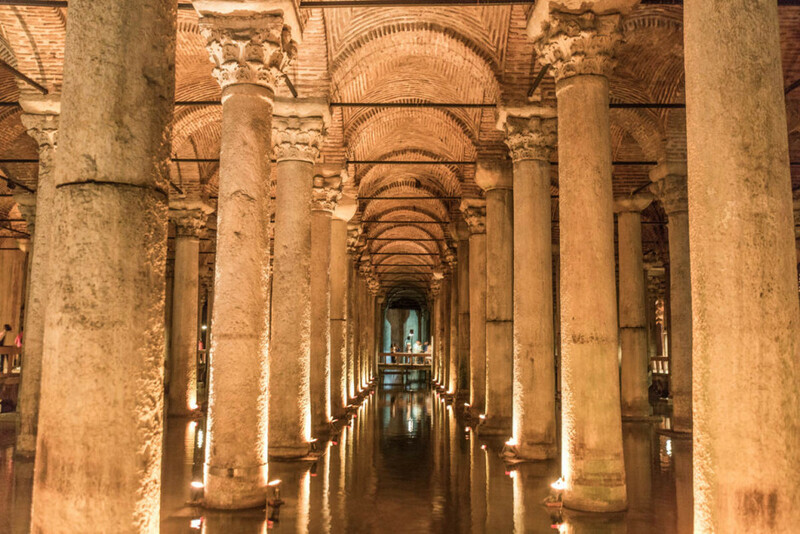 Just down the road from the Blue Mosque is the Basilica Cistern, a “sunken palace” that lies beneath the surface of Istanbul’s streets. Originally built in the 3rd and 4th centuries as a commercial center, it was later repurposed as part of a water filtration system. 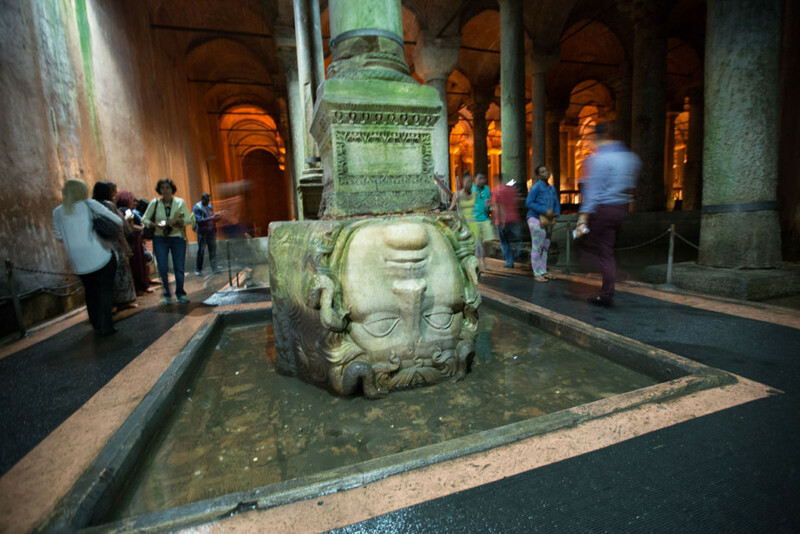 Within the cistern, you can also see a statue of the head of Medusa. It’s said that it’s upside down in order to cancel out the power of her stare...but then again, it’s also said that it was simply rotated to fit the space of the column above it. I guess you’ll just have to give Medusa a stare and decide for yourself. Another of Istanbul's most renowned and impressive structures, the Hagia Sophia was once a Christian church but was transformed to a mosque in the year 1453 under Sultan Mehmed II. 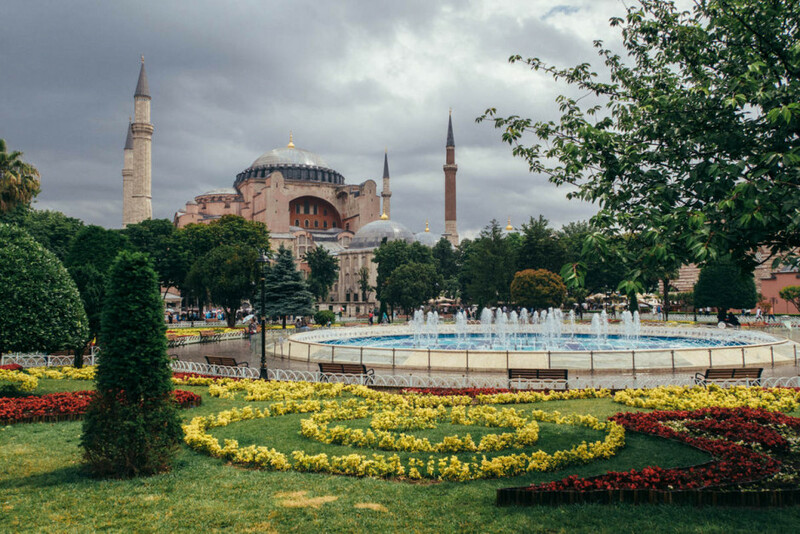 Just a stone’s throw from the Blue Mosque, it pairs nicely with the latter to dominate the skyline of old Istanbul. 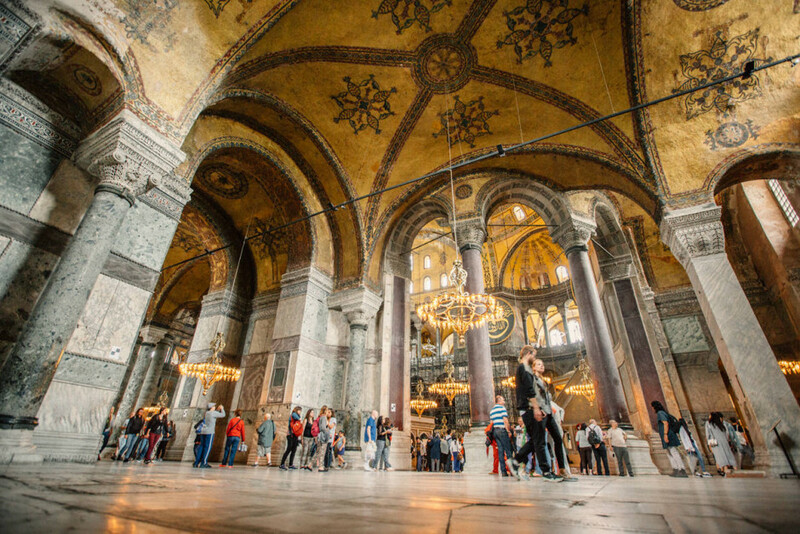 A walk through the Hagia Sophia will leave you pretty close to breathless—the size, the details of the mosaics—it’s definitely got the feeling of a beautiful marriage between Eastern and Western design. Did I mention how beautiful the mosaics are? The Deësis is one of those incredible pieces you have to see. Dating to around 1261, it was commissioned to mark the return to the Orthodox faith. Don’t forget your selfie stick! Good news: On nearly every corner in Istanbul, someone’s ready to sell you this must-have accessory. 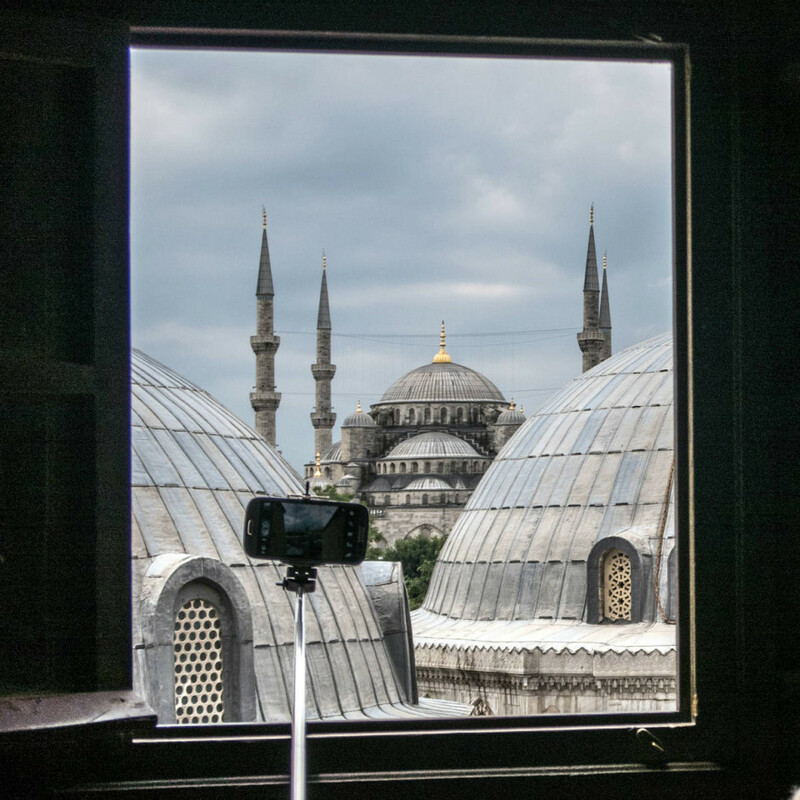 It’ll come in handy—as you can see, everywhere you turn there are amazing images to be captured, such as this one of the Blue Mosque from an upstairs window in the Hagia Sophia. 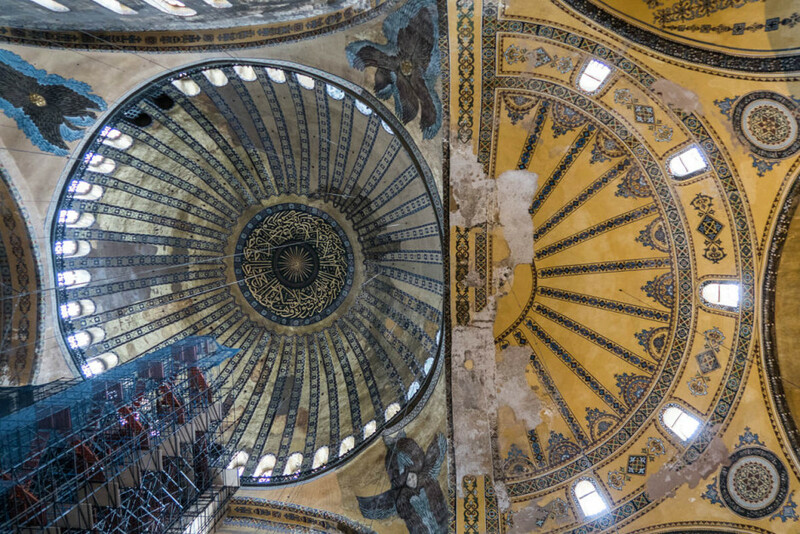 The multicolored marble and mosaics of the Hagia Sophia’s walls extend right up to the towering main vault, which, when first constructed, was the biggest, tallest, and most impressive dome in the Byzantine Empire. 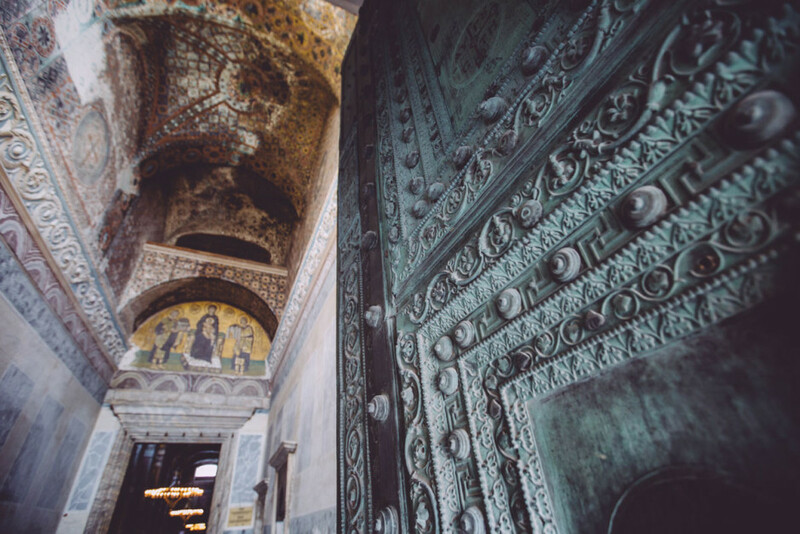 The detail of the Hagia Sophia could have you walking around the place for days. Even the doorways on your way out have you standing still in your tracks. 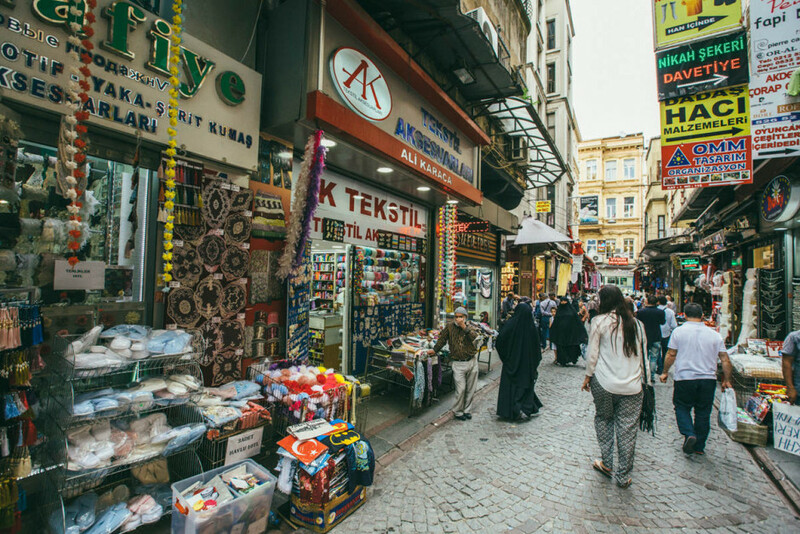 The streets of Istanbul are a mixture of modern and old buildings, both of which offer tons of opportunities to buy delicious street food and local wares. 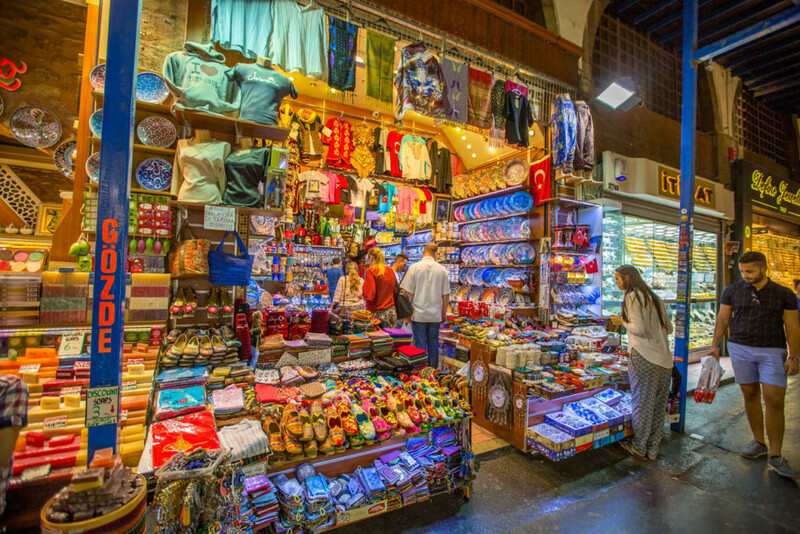 The shopping in Istanbul is abundant; small shops and vendors greet you around every corner. From Ottoman antiques to the hip Turkish brand Mavi, it’s all here. 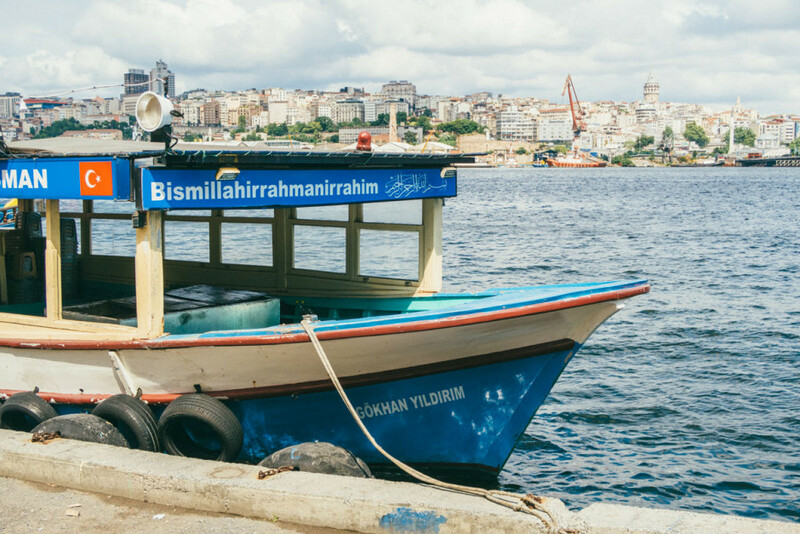 Make sure your Istanbul bucket list includes crossing the Golden Horn for a trip over to the Karaköy district. 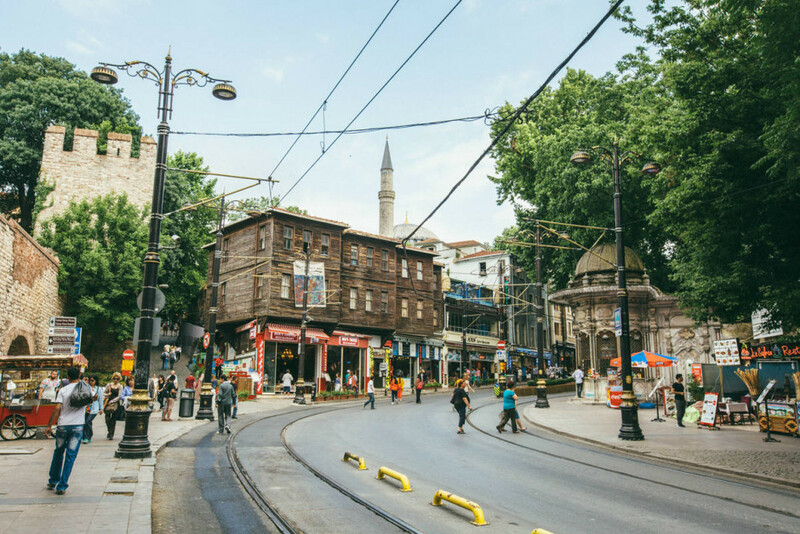 This part of Istanbul is one of the city’s hottest areas, and it continues to grow with new shops, rooftop bars, and boutiques. 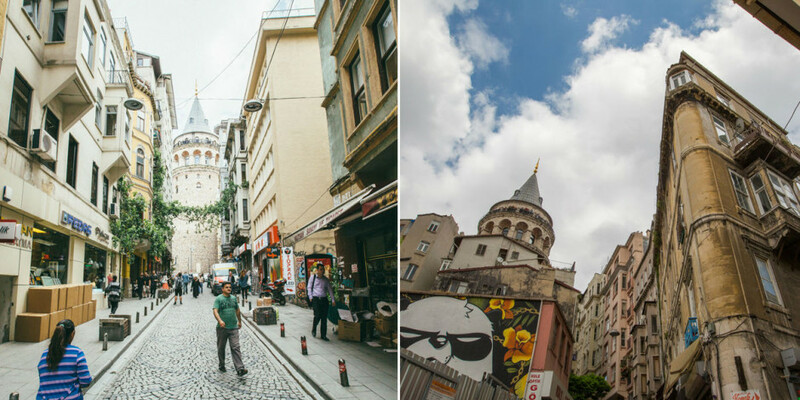 The Galata Tower is another Istanbul icon—you’ll find it in the buzzing Karaköy / Galata district. Constructed in 1348, it was the tallest building in the city for many centuries. Head to the top for unparalleled views of the metropolis. An afternoon break for some Turkish tea is a must. 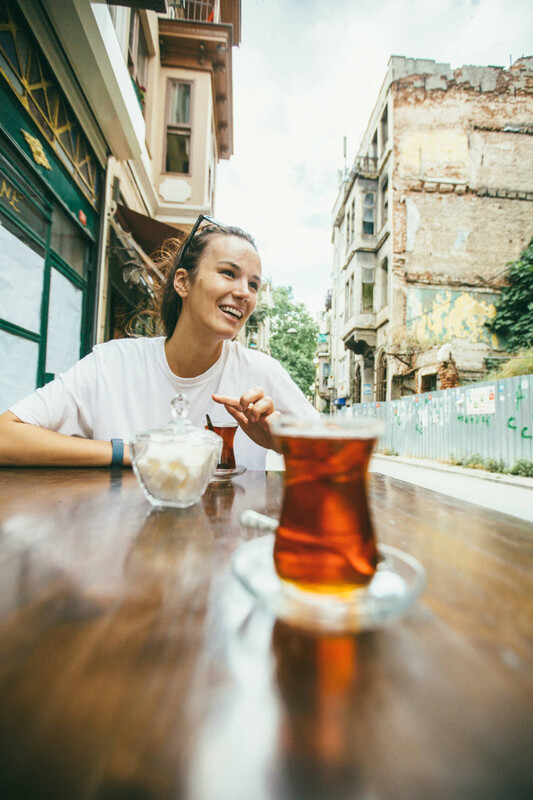 Everywhere you go, you’ll find people sitting down to çay. In fact, Turkey has the highest annual per capita consumption of tea in the world. 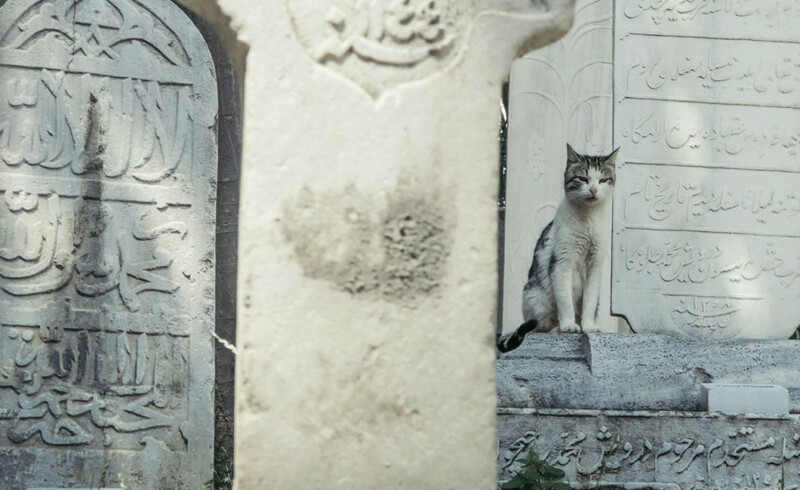 Istanbul is a cat lover’s dream. Everywhere you turn, you’re likely to find a friendly feline rubbing up against you. Daily walks by the water were a highlight of my trip. Spanned by five bridges, the Golden Horn is the primary inlet of the Bosphorus in Istanbul. It’s also known by its modern Turkish name—Haliç. 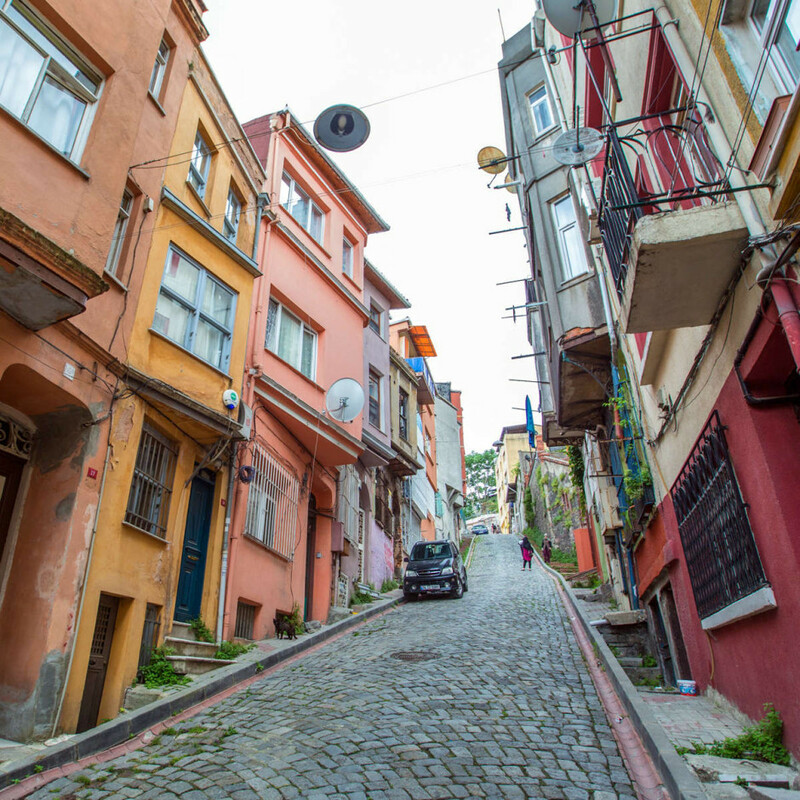 Colorful Balat is Istanbul’s traditional Jewish quarter. Its ice-cream-colored buildings hug hills so steep you almost feel like you're in San Francisco. You had better be in shape to make your way up the streets of Balat. 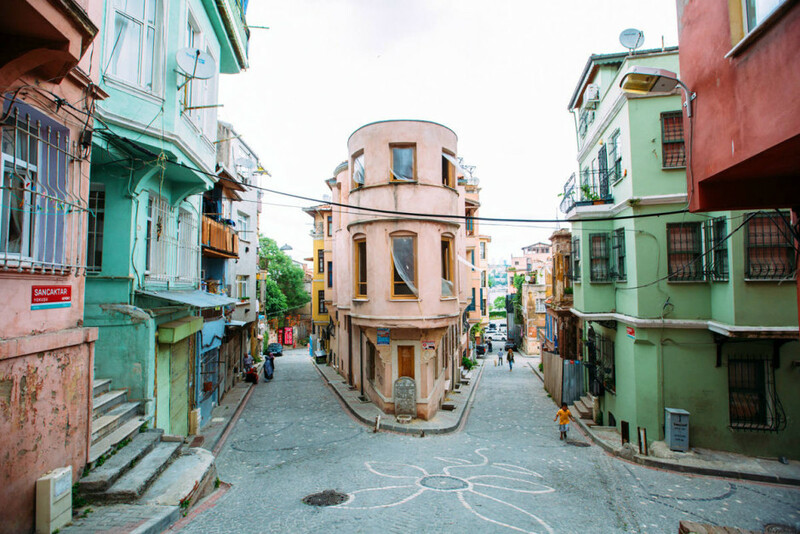 An up-and-coming design district, tours of the area were a main event at last fall’s Istanbul Design Biennial. 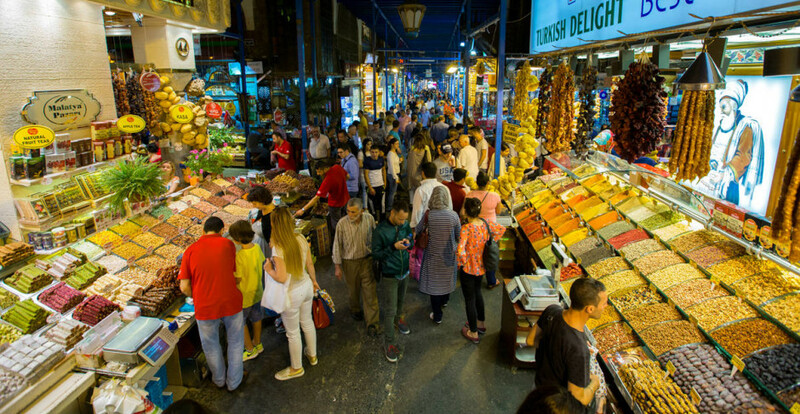 Istanbul is home to the Grand Bazaar, one of the oldest and most expansive covered markets in the world, but that's not the only game in town. 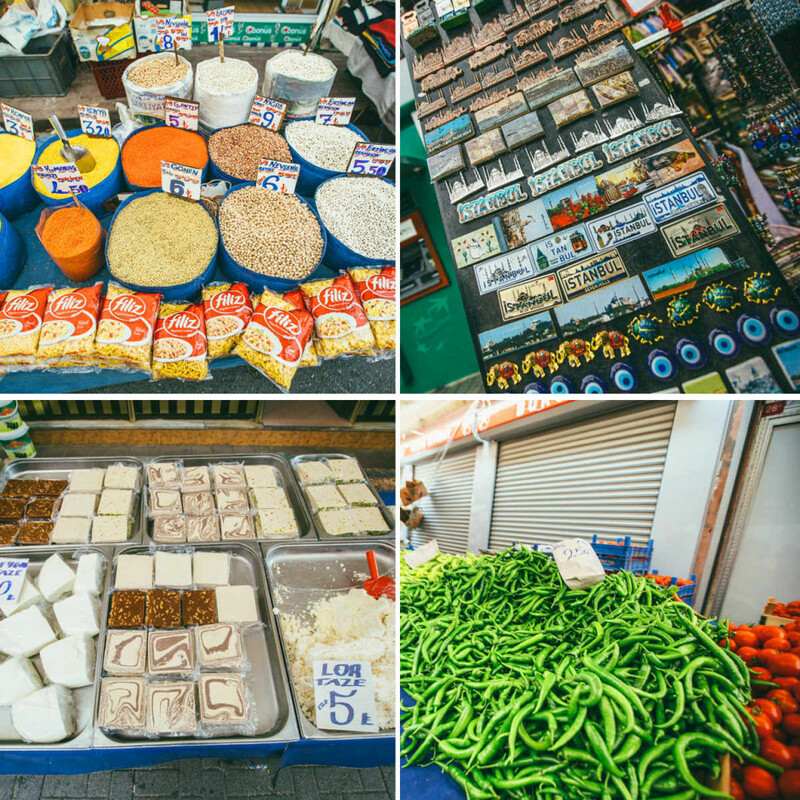 Welcome to the Spice Bazaar, in the neighborhood of Eminönü. 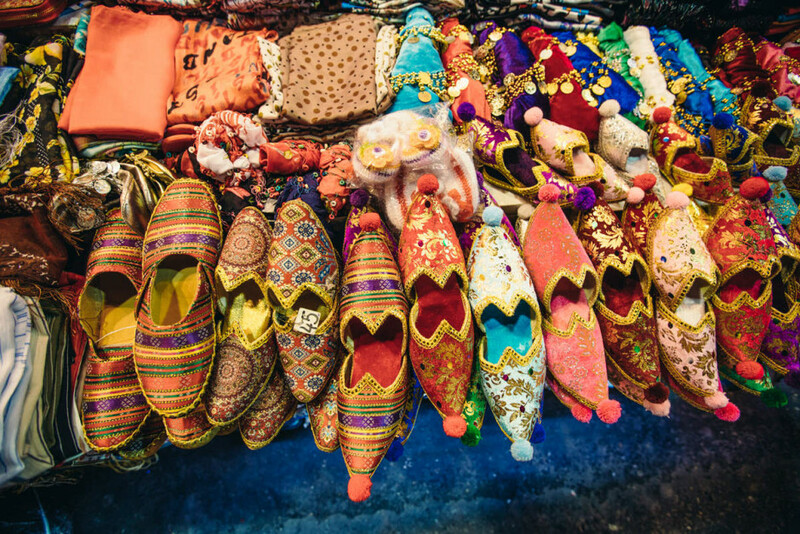 Just a small assortment of the things you'll come across while shopping in and around the Spice Bazaar. If you’ve learned the art of bargaining, it’ll come in handy here. You'll get better prices the further into the bazaar you venture. 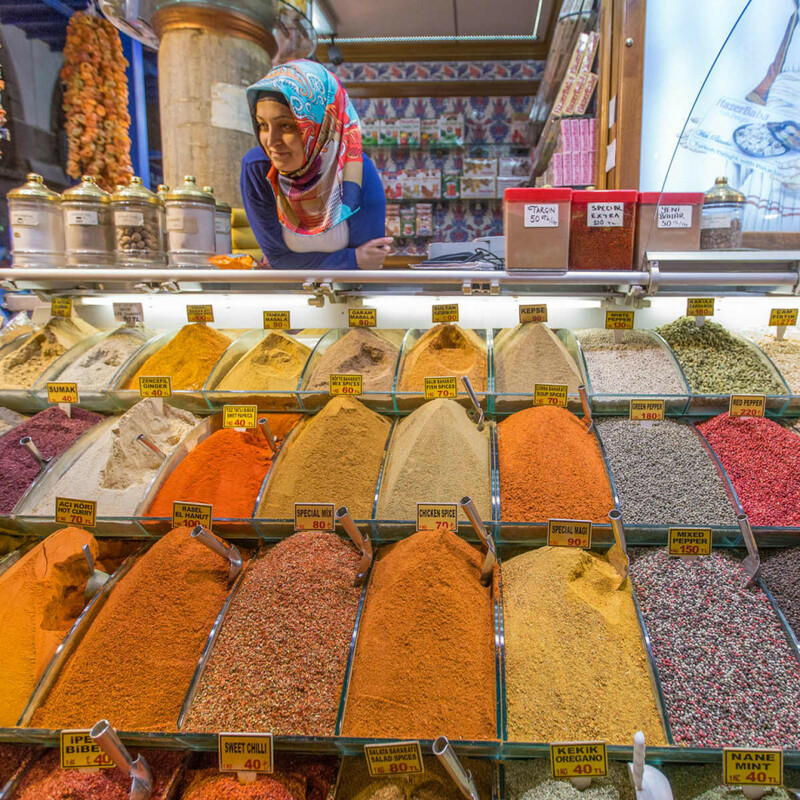 Spices, sweets, nuts, and dried fruits can all be found at the Spice Bazaar. Of course, it's much more than just spices. Shoes of every hue can be purchased here. Other popular buys include carpets and kilims (tapestry-woven rugs), leather goods, textiles, antiques, and jewelry.